Background Human hepassocin (HPS) was originally detected by subtractive and differential cDNA cloning as a liver-specific gene that was markedly upregulated during liver regeneration. Previous studies suggested that HPS showed mitogenic activity on isolated hepatocytes in vitro. However, its in vivo functions remained largely unknown. Therefore, the function of recombinant human HPS during liver regeneration and chemically induced liver injury was investigated. Methods The proliferation of primary hepatocytes was examined by [3H]thymidine incorporation and immunohistological staining of proliferating cell nuclear antigen (PCNA). RNA interference was performed to knock down the endogenous expression of HPS. The proliferation of L02 cells was examined by MTS assay. The phosphorylation of ERK1/2 (extracellular signal-regulated kinase 1/2) was investigated by western blotting analysis. Assessment of liver injury (histology, serum alanine aminotransferase (ALT) and aspartate aminotransferase (AST) levels) and of apoptosis, by TUNEL (terminal deoxynucleotidyl transferase-mediated dUTP nick-end labelling) assay, was performed. Results Purified recombinant human HPS showed specific mitogenic activity on primary hepatocytes and normal liver cell lines in a mitogen-activated protein kinase (MAPK)-dependent manner and stimulated the proliferation of hepatocytes in rats with 70% partial hepatectomy. 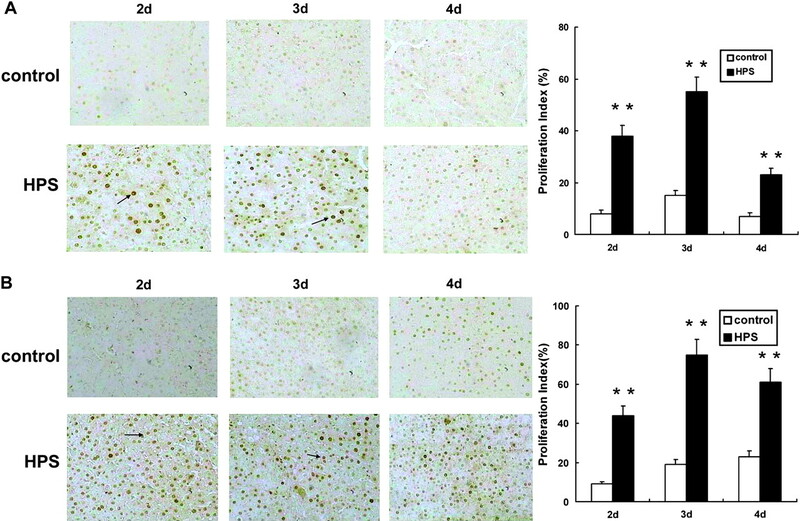 Administration of HPS to rats after d-galactose and carbon tetrachloride (CCl4) treatment protected against liver injury (minimal liver necrosis, depressed ALT and AST levels, and decreased lethality), reduced apoptosis and enhanced proliferation. Knock-down of endogenous HPS in vivo enhanced the liver injury induced by d-galactose by increasing the apoptosis and elevating ALT and AST levels. Conclusions HPS is a hepatic growth factor which can accelerate hepatocyte proliferation in vivo and protect against liver injury. These data point to the potential interest of HPS in the treatment of fulminant hepatic failure. Hepatic regeneration is an important component of the recovery process occurring after liver injury, and improvement of hepatocyte proliferating capacity could be of critical importance in fulminant hepatic failure (FHF). In liver regeneration, the existence of liver-specific growth factors has been extensively reported.1 Hepatocyte growth factor (HGF), as the most effective mitogen, inhibits liver injury by stimulating hepatocyte proliferation and protecting hepatocytes from apoptosis.2 Transforming growth factor α (TGFα) is produced by hepatocytes themselves and provides a mitogenic stimulus through an autocrine mechanism.3 Epidermal growth factor (EGF) provides a mitogenic stimulus on hepatocytes through the endocrine system.4 Other growth factors, such as fibroblast growth factor-1 and vascular endothelial growth factor, are also produced by regenerating hepatocytes and affect growth and differentiation of endothelial cells through paracrine mechanisms.5 6 On the other hand, many studies in patients and animal models have strongly suggested that different cytokines and growth factors are involved in regulation of hepatic injury. Tumour necrosis factor α (TNFα) and Fas ligand (FasL) are involved in the induction of apoptosis and in triggering destruction of the liver, which ultimately leads to hepatic failure.7–9 Interleukin 6 (IL-6) is one of the key regulators of the initial steps of liver regeneration, and its protective role in liver injury has been investigated.10 To date, cytokine or growth factor treatments for FHF are still in an experimental stage and their usefulness remains to be proven. Therefore, in order to develop new and innovative strategies to treat FHF, it is important to gain a better understanding of the events that take place during FHF and to evaluate the cytokines and molecular pathways that mediate liver regeneration. Hepassocin (HPS) was originally detected by subtractive and differential cDNA cloning as a liver-specific protein that was markedly overexpressed in a hepatocellular carcinoma with the name HFREP-1.11 A more recent study, however, showed that HFREP-1 is frequently downregulated in hepatocellular carcinoma and might possess growth suppression activity.12 Hara et al reported that expression of HPS mRNA was detected mainly in adult and fetal livers.13 During liver regeneration, the expression of HPS mRNA was strongly upregulated.13 Furthermore, HPS showed mitogenic activity on isolated hepatocytes14 while it did not promote DNA synthesis in established cell lines.13 Thus, it appeared that HPS acts as a liver-specific mitogenic growth factor in the process of liver regeneration. In the present study, we found that recombinant human HPS showed specific mitogenic activity on primary hepatocytes and normal liver cell lines in a mitogen-dependent protein kinase (MAPK)-dependent manner and stimulated the proliferation of hepatocytes in rats with 70% partial hepatectomy (PHx). Furthermore, HPS was capable of preventing d-galactose (d-gal)- and carbon tetrachloride (CCl4)-induced liver injury, inhibiting hepatocyte apoptosis and improving the survival of lethal hepatitis. These results demonstrated that HPS maybe play an important role in liver regeneration and suggested a potential therapeutic value of HPS in the treatment of FHF. LY294002, U0126, BAY 11-7082 and SB203580 were purchased from Promega (Madison, Wisconsin, USA). [3H]Thymidine was purchased from Amersham Pharmacia Biotechnology (Piscataway, New Jersey, USA). HGF, d-gal, CCl4 and human serum albumin (HSA) were purchased from Sigma (St. Louis, Missouri, USA). Primary human hepatic cells were purchased from ScienCell Research Laboratories (Carlsbad, California, USA). Human hepatic cell line L02 and human hepatoma cells lines HepG2 and SMMC7721 were purchased from Type Culture Collection of the Chinese Academy of Sciences (Shanghai, China) and maintained in Dulbecco's modified Eagle's medium (DMEM; Gibco Invitrogen, Carlsbad, California, USA) with 10% fetal bovine serum (FBS). Primary rat and mice hepatocytes were isolated by a two-step collagenase perfusion15 and cultured in DMEM containing 10% FBS, 2 mM l-glutamine, 1 mM sodium pyruvate and antibiotics. Eight-week-old male Wistar rats with a body weight of 150–180 g were obtained from the Beijing Institute of Radiation Medicine (BIRM) Animal Center (Beijing, China) and had free access to water and food. All surgical procedures were approved by the Animal Care Committee of BIRM. Animals received humane care according to the criteria outlined in the ‘Guide for the Care and Use of Laboratory Animals’ prepared by the National Academy of Sciences and published by the National Institutes of Health. Using male rats, we removed 70% of the liver under isoflurane anaesthesia as described.16 The HPS treatment group were injected intraperitoneally with 1 μg/kg of HPS and the control group received HSA subcutaneously 2 h later and were sacrificed at the indicated time points. All experiments were repeated by a second group of independent investigators with similar results. The dosage of d-gal required for mortality of rats was determined in a dose–response experiment in which rats were injected intraperitoneally with d-gal at dosages of 1, 1.2, 1.4 or 1.6 g/kg body weight. The results revealed that the mortality dosage of d-gal for male rats was 1.4 g/kg body weight. The dose of CCl4 (2 ml of CCl4 in corn oil (1:1 v/v) per 1 kg of body weight) for induction of lethal hepatotoxicity was identified using similar experiments. To determine the optimal dose of d-gal for inducing severe but non-lethal hepatotoxicity, five groups of rats each received a single intraperitoneal injection with d-gal at dosages of 200, 300, 400, 500 or 600 mg/kg body weight. The results revealed that these rats developed the hepatotoxic effect after the intraperitoneal administration of 500 mg/kg of d-gal. A dose of CCl4 (500 μl/kg) for induction of severe but non-lethal hepatotoxicity was identified using the same methodology. Cells were cultured at a density of 3×104 cells/ml in 96-well plates in the presence or absence of different concentrations of HPS as indicated. After 24 h, cell proliferation was measured by adding 0.5 μCi of [3H]thymidine for 3 h, after which cells were harvested onto glass-fibre filters. Radioactivity incorporated was quantified by scintillation counting. Total lysates from cell cultures or tissues were prepared with M-PER Mammalian Protein Extraction Reagent (Pierce, Rockford, Illinois, USA) according to the manufacturer's instructions. Then, 20 μg of protein was loaded onto the gel. After separation by sodium dodecyl sulfate–polyacrylamide gel electrophoresis (SDS–PAGE), the proteins were transferred to nitrocellulose membranes and probed with antibodies at the following concentrations: extracellular signal-regulated kinase (ERK), 1:1000 and phosphorylated ERK (p-ERK), 1:1000 (Cell Signal Technology, Beverly, Massachusetts, USA); the cleaved caspase 9 antibody (9507, Cell Signal Technology), 1:1000; Bax, 1:500; Bcl-2, 1:1000; HPS (human), 1:500; proliferating cell nuclear antigen (PCNA), 1:1000 (Santa Cruz Biotechnology, Santa Cruz, California, USA); and HPS (rat), 1:500 (R&D Systems, Minneapolis, Minnesota, USA). Chemiluminescent detection was conducted using the supersignal substrate (Pierce) according to the manufacturer's specifications. Tissues were fixed in 10% formalin, embedded in paraffin and 4 μm sections were stained with H&E for histopathological and morphological analysis. For PCNA detection, liver tissues were removed for immunohistological staining using rat anti-PCNA antibody. The ‘proliferation index’ was defined as the percentage of PCNA-positive cells counted in five fields which were randomly selected per slide. The TUNEL assay was performed using The DeadEnd Colorimetric TUNEL System (Promega) according to the manufacturer's protocol. The TUNEL-positive cells were quantitated by light microscopy. Five (×200 magnification) fields were randomly selected per slide and 100 hepatocytes counted per field. The mean percentage of apoptotic hepatocytes was calculated and compared between different study groups. Serum activities of ALT and AST were measured with an autoanalyser (Hitachi 7020 automatic analyser, Hitachi, Tokyo, Japan) and expressed in IU/l. The small interfering RNA (siRNA) oligos of human HPS were synthesised by GenePharma Biotechnology (Shanghai, China); the sequences are as follows: siHPS-1 sense, ACG AUC UGA UGG CAG UGA ATT; antisense, UUC ACU GCC AUC AGA UCG UTT; siHPS-2 sense, GGG AAA UUU CGG CGC UCG ATT; antisense UCG AGC GCC GAA AUU UCC CTG. The negative control (non-silencing) siRNAs were obtained from Qiagen (Germantown, Maryland, USA). siRNAs were transfected into L02 cells using Lipofectamine 2000 (Invitrogen) at a concentration of 20 nM. For in vivo RNAi treatment, the siRNAs were synthesised using 2′-O-ACE-RNA phoshoramidites (GenePharma Biotechnology). The sense and antisense strands of siRNA against mouse HPS were: si-mHPS-1 sense, GCU UGA GAC CCG GGU CAA ATT; antisense, UUU GAC CCG GGU CUC AAG CTG; si-mHPS-2 sense, CAA GGA GAC UAC ACU UUA ATT; antisense, UUA AAG UGU AGU CUC CUU GAA; si-mHPS-3 sense, GCA CGU GGG ACA GAG AUA ATT; antisense, UUA UCU CUG UCC CAC GUG CTG. Male BALB/c mice, 6–8 weeks of age and weighing 18–22 g, were fed a normal diet with free access to food and water. Synthetic siRNAs were delivered in vivo using the TransIT In Vivo Gene Delivery System (Mirus, Madison, Wisconsin, USA) according to the manufacture with modifications involving rapidly injecting 20 μg of siRNA into the tail vein. The injection was repeated 8 and 24 h later. Control mice were injected with an equal volume of normal saline or control negative siRNA. A total of 1×103 cells were seeded in each well of 96-well plates and left overnight to adhere. Absorbance was determined by using the CellTiter 96 Aqueous One Solution Reagent (Promega) according to the manufacturer's protocol. All experiments were conducted three times. All data are represented as means ± SD, and the statistical significance was assessed by one-way analysis of variance followed by Students–Newman–Keuls tests. Survival of rats was determined by the Kaplan–Meier method and compared by the log-rank test. For all tests, p<0.05 was considered significant. The HPS expression construct was transformed in Escherichia coli DH5a and protein expression was tested under various conditions. The level of HPS expression was very high at 42°C continually for 5 h to induce specific protein expression. The expressed recombinant proteins aggregated and appeared in inclusion bodies (Supplementary figure 1 online). Further recombinant HPS protein was purified by ion-exchange chromatography and gel filtration and then visualised by SDS–PAGE. During the refolding process, realised by moving to a mild denaturating agent and finally to a physiological buffer, the reduced denatured protein recovers its active conformation, as demonstrated by biological activity tests (see below). The main recombinant product is a 66 or 34 kDa protein in non-reduced or reduced conditions, respectively, as recognised by anti-HPS monoclonal antibody (Supplementary figure 2 online). Analysis of recombinant HPS by matrix-assisted laser desorption ionisation-time of flight (MALDI-TOF) mass spectrometry showed a single, non-dispersed signal (data not shown). The molecular weight is 36.37 kDa (data not shown), which perfectly matches the mass calculated from the amino acid sequence 36.3795 kDa. 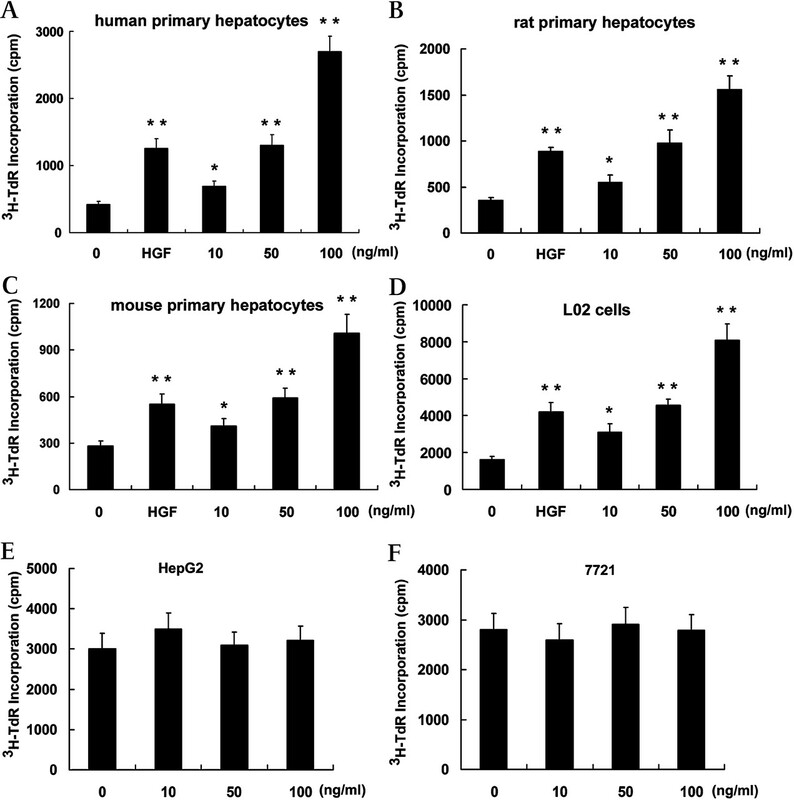 To investigate the effect of HPS on the proliferation of cells, human, rat and mouse primary hepatocytes, human hepatic cell line L02, human hepatoma cell line HepG2 and SMMC 7721 cells were cultured in the presence or absence of HPS at the indicated concentration; the [3H]thymidine incorporation assay was performed 24 h later. As figure 1 shows, the proliferation of primary hepatocytes (human, rat and mouse) and L02 cells was increased significantly in a dose-dependent manner, peaking at 100 ng/ml HPS. However, no stimulating activity was observed in the hepatoma cell line HepG2 and SMMC 7721 cells (figure 1E, F). Recombinant human hepassocin (HPS) specifically stimulates the proliferation of hepatocytes. Human primary hepatocytes (A), rat primary hepatocytes (B), mouse primary hepatocytes (C), L02 cells (D) and hepatocellular carcinoma cells HepG2 (E) and SMMC 7721 (F) were cultured in medium containing 10% fetal bovine serum (FBS) in the presence or absence of HPS at the indicated concentrations. Twenty-four hours later, a [3H]thymidine (TdR) incorporation assay was performed. HGF (20 ng/ml) was used as a positive control. Values are the mean±SD of triplicate measurements. The statistical difference between the samples was demonstrated as *p≤0.05 or **p≤0.01. To confirm whether HPS-dependent proliferation was specific for hepatocytes, cell lines from various tissues were treated with HPS and the proliferation was analysed. As shown in Supplementary figure 3 online, HPS had no stimulating activity on these cell lines, suggesting that the HPS is a specific mitogenic factor for the proliferation of hepatocytes. We further performed RNAi assays to investigate the role of endogenous HPS in human hepatocytes. 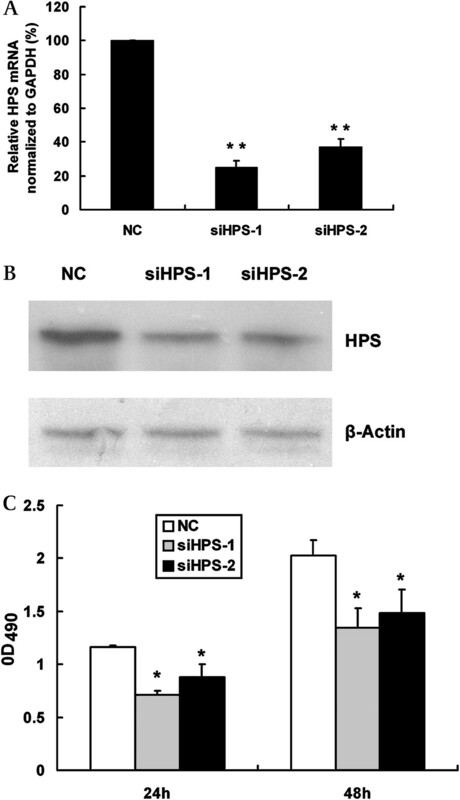 Two siRNA oligos were used (siHPS-1 and siHPS-2) to rule out off-target effects. 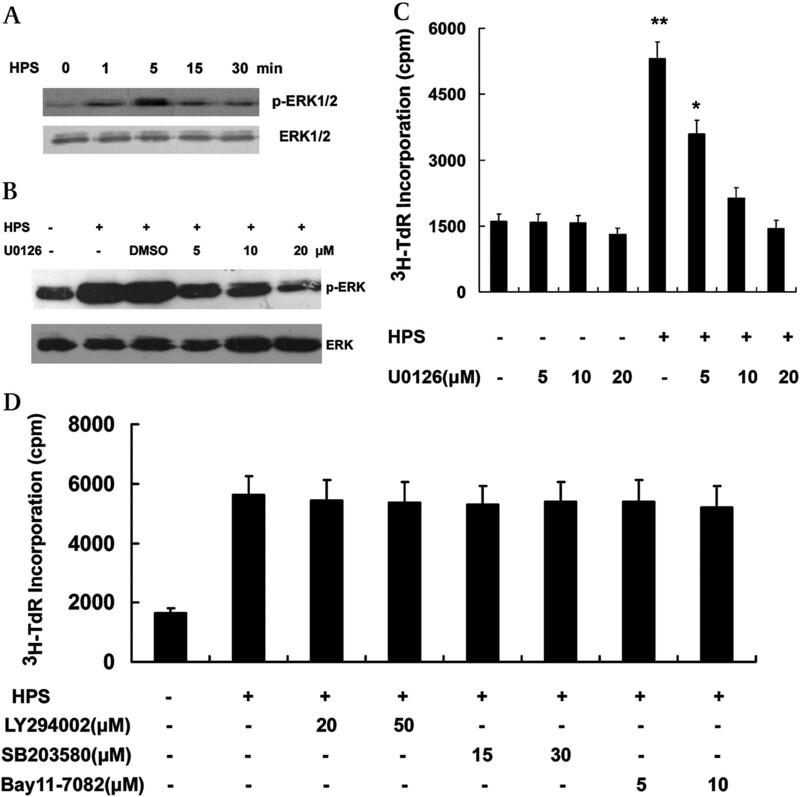 Transfection of L02 cells with siHPS-1 or siHPS-2 resulted in up to a 75% or 63% decrease in the HPS mRNA level (figure 2A) and a 60% or 53% decrease in the HPS protein level (figure 2B) by 48 h after transfection. Then L02 cells were transfected with HPS siRNA or control siRNA and starved of serum for 24 h. The same number of cells was seeded in 96-well plates in the presence of 10% FBS. The cell proliferation was analysed by MTS assay at the indicated time points. As shown in figure 2c, when endogenous HPS expression was knocked down, L02 cells showed a reduced proliferation rate compared with the control cells. The result suggested that HPS might play a key role in the proliferation of hepatocytes. Knockdown of endogenous hepassocin (HPS) inhibits the proliferation of L02 cells. (A) Knockdown of endogenous HPS by small interfering RNA (siRNA) oligos or a negative control siRNA (NC) was analysed by real-time PCR. The results were expressed as fold induction compared with cells transfected with control siRNA and normalised to glyceraldehyde phosphate dehydrogenase (GAPDH) mRNA. Each bar represents the mean±SD for three independent experiments. The statistical difference between the samples was demonstrated as **p≤0.01. (B) Knockdown of endogenous HPS was analysed by western blotting analysis. β-Actin was used as internal control. (C) L02 cells were transfected with siRNA oligos and starved of serum for 24 h. Then, 1×103 cells were seeded in each well of 96-well plates. The MTS assay was performed at the time points indicated. Results represent the mean±SD of triplicate measurements. The statistical difference between the samples was demonstrated as *p≤0.05. To determine which signal transduction pathway was activated by HPS stimulation, primary human hepatocytes were starved of serum for 12 h and then treated with 50 ng/ml HPS for the indicated time. As shown in figure 3A, the phosphorylated forms of ERK (p44 and p42) were increased as early as 1 min, peaked to approximately sixfold the basal level within 5 min, and was maintained for up to 30 min. No change in phosphorylation of Akt and p38 was observed following HPS treatment (data not shown). The mitogen-activated protein kinase (MAPK) signal pathway was essential for hepassocin (HPS)-induced proliferation of human primary hepatocytes. (A) Human primary hepatocytes were starved of serum for 12 h and then treated with 50 ng/ml HPS for the times indicated. Total cell lysates were prepared for western blotting analysis. (B) Human primary hepatocytes were pretreated with U0126 at the indicated concentrations for 1 h followed by addition of 50 ng/ml HPS. Five minutes later, total cell lysates were prepared for western blotting analysis. (C) Human primary hepatocytes were pretreated with U0126 or other inhibitors (D) at the indicated concentrations for 1 h and then cultured in medium containing 10% fetal bovine serum (FBS) in the presence of 50 ng/ml HPS for 24 h. The proliferation of cells was investigated by [3H]thymidine incorporation. Values are the mean±SD of triplicate measurements. The statistical difference between the samples was demonstrated as *p≤0.05 or **p≤0.01. ERK, extracellular signal-regulated kinase; p-ERK, phosphorylated ERK; TdR, thymidine. To assess whether the MAPK pathway was necessary for HPS-induced proliferation of hepatocytes, hepatocytes were pre-treated with U0126 (the MEK inhibitor) (figure 3B) at the indicated concentrations for 1 h and then cultured in the presence or absence of 50 ng/ml HPS for 24 h. As shown in figure 3C, the proliferation induced by HPS was inhibited by U0126 in a dose-dependent manner. However, the proliferation induced by HPS was not affected by LY294002 (a phosphatidylinositol 3-kinase (PI3K) inhibitor), SB203580 (a MAPK/p38 inhibitor) or BAY 11-7082 (a nuclear factor-κB (NF-κB) inhibitor) (figure 3D). These results suggested that the MAPK pathway was essential for HPS-induced proliferation of primary hepatocytes. To explore the function of HPS in vivo, we first analysed the kinetics of HPS mRNA expression during liver regeneration after 70% PHx, and found that the level of liver HPS mRNA was increased 6 h after PHx, peaked at 24 h and returned to the normal level by 3–4 days (figure 4A). HPS protein level was increased by 12 h, peaked at 36 h and remained significantly increased up to 48 h (figure 4B). This expression pattern of HPS was consistent with the proliferation process of hepatocytes after PHx (figure 4C). Hepassocin (HPS) increases liver regeneration induced by partial hepatectomy (PHx). Wistar rats were subjected to 70% PHx and then were sacrificed at the indicated time points. Total RNA was extracted for real-time PCR analysis (A). Results were expressed as fold induction compared with liver samples without PHx and normalised to glyceraldehyde phosphate dehydrogenase (GAPDH) mRNA. Each bar represented the mean±SD for three independent experiments. (B) Total lysates were prepared from the liver samples for western blotting analysis. β-Actin was used as an internal control. (C) The hepatocyte proliferation was assessed by immunohistological staining for proliferating cell nuclear antigen (PCNA). PCNA-positive nuclei were shown by the arrows, and are expressed as proliferation index. Magnification ×200. The statistical difference between the two groups was demonstrated as *p≤0.05 or **p≤0.01. Next, we addressed the role of HPS in liver regeneration by analysing the proliferative response after PHx in the presence or absence of HPS. As expected, 12 h after PHx, there was an increase in the number of PCNA-positive cells (9.3%, n=4) in the control group (figure 4C), while in the HPS-treated group the proliferation index was 18.5%. At 24 h after PHx, the control-treated rats showed a strong increase in the number of PCNA-positive cells (58.4%, n=4), and HPS-treated rats showed a marked increase in the number of PCNA-positive nuclei (78.3%, n=4). After 3 days there was a further increase in PCNA expression in control-treated animals (22.2%) and at this time point, HPS-treated animals showed a higher percentage of PCNA-positive nuclei (47.4%) than the control group. These findings suggest that HPS exerted an important role in promoting cell proliferation in hepatocytes after PHx. To test whether HPS could improve survival after the administration of high lethal doses of d-gal or CCl4 to induce FHF, Wistar rats were injected intraperitoneally with 1.4 mg/kg d-gal or 2 ml/kg CCl4. Four hours later, we administered a single injection of HPS at a dosage of 1 μg/kg or the same dose of HSA as negative control. Kaplan–Meier analysis was performed 24 h later to demonstrate the survival rate. We observed 80% or 90% lethality in the HSA control groups after 5 days d-gal or CCl4 administration (figure 5). Rats given HPS injections were significantly protected from d-gal- and CCl4-induced lethality. In the HPS treatment groups, only 20% and 50% lethality at 48 h was observed. Seven of the 10 animals treated with HPS survived for >10 days in the d-gal-induced group, and four of the 10 animals treated with HPS survived for >10 days in the CCl4-induced group. These results suggested that HPS could prevent rat death caused by liver function failure. Hepassocin (HPS) protects rats against chemically induced lethality. Wistar rats were injected iintraperitoneally with 1.4 mg/kg d-galactose (d-gal) (A) or 2 ml/kg carbon tetrachloride (CCl4) (B) and then treated with 1 μg/kg HPS or the same dosage of human serum antigen (HSA) as control 4 h later. Cumulative survival analysis of HPS-treated rats compared with control rats was determined with a Kaplan–Meier plot. To confirm the protective effects of HPS on chemically induced severe but non-lethal hepatotoxicity, rats were injected intraperitoneally with 500 mg/kg of d-gal or 500 μl/kg CCl4, and 4 h later administered a single injection of recombinant HPS at the indicated concentrations or the same doses of HSA as negative control. We observed that administration of HPS significantly reduced the elevation of ALT and AST levels in serum induced by d-gal (table 1) or CCl4 (table 2) in a dose-dependent manner. Liver histology revealed that there were no pathological changes in healthy control livers which showed normal lobular architecture with a central vein and radiating hepatic cords. In the d-gal-treated control group, massive haemorrhagic necrosis, vacuolar degeneration and cytoplasmic swelling of most of the surviving hepatocytes were observed. In addition, considerable neutrophil infiltration was seen in a broad necrotic and degenerated area. In the CCl4-treated control group, sections show necrosis of hepatocytes, hepatocyte degeneration and infiltration of inflammatory cells. There was marked neutrophilic and mononuclear cell infiltration with severe centrilobular congestion. Bridging necrosis was present in certain cases. In both HPS-treated groups of rats, mild scattered necrosis, vacuolar degeneration and moderate neutrophil infiltration were observed. The extent of liver necrosis and degeneration and the numbers of infiltrating neutrophils in the HPS-treated rats were significantly reduced in a dose-dependent manner compared with control rats receiving d-gal or CCl4 (figure 6). Histological examinations of rat livers. Wistar rats were injected intraperitoneally with 500 mg/kg d-galactose (d-gal) (A) or 500 μl/kg carbon tetrachloride (CCl4) (B) for 4 h followed by treatment with 1 μg/kg hepassocin (HPS) or the same dose of human serum antigen (HSA). At the indicated time points, the rats were sacrificed and the liver tissues were fixed, sectioned and stained with H&E for histopathological and morphological analysis. Magnification ×100. Since HPS stimulated hepatocyte proliferation in liver regeneration after PHx, we explored the hypothesis that HPS stimulates hepatocyte proliferation in chemically induced liver injury of rats. Forty-eight hours after d-gal or CCl4 treatment, rats were sacrificed and the liver tissues were fixed for PCNA labelling. As figure 6 shows, 2 days after d-gal (figure 7A) or CCl4 (figure 7B) injection, 40–50% of the hepatocytes in the HPS-treated groups were PCNA positive. However, in the control groups, there were <20% of PCNA-positive cells. Up to 4 days after treatment, the HPS groups still had a higher rate of PCNA-positive cells compared with the control. These results suggested that HPS significantly stimulated the proliferation of hepatocytes in vivo. Enhancement of hepatocyte proliferation by hepassocin (HPS) after induced liver injury. Wistar rats were injected intraperitonally with 500 mg/kg d-galactose (d-gal) (A) or 500 μl/kg carbon tetrachloride (CCl4) (B) for 4 h followed by treatment with 1 μg/kg HPS or the same dose of human serum antigen (HSA). At the time points indicated, rats were sacrificed and the hepatocyte proliferation was assessed by immunohistological staining for proliferating cell nuclear antigen (PCNA). PCNA-positive nuclei are shown by the arrows, and expressed as the proliferation index. Magnification ×200. The statistical difference between the two groups was demonstrated as *p≤0.05 or **p≤0.01. d-Gal is known to induce significant apoptosis, although the exact mechanism of this effect is not known.17 Since we observed that HPS could protect against the d-gal-induced liver injury, we investigated whether HPS could affect apoptosis induced by d-gal. Livers of animals who were administered HPS demonstrated a significant decrease in hepatocyte apoptosis (figure 8). Twelve hours after the d-gal treatment, the livers of control groups showed 7.5% hepatocyte apoptosis whereas in the HPS group only 4.1% apoptosis was observed. At 24 h, the apoptosis was significantly increased to 45.3% in the control group, and the HPS treatment group showed 18.3% apoptosis. Up to 72 h later, the control group still showed 17.2% TUNEL-positive cells while the apoptosis in the HPS group was decreased to 2.9%. These data indicated that HPS prevents liver failure induced by d-gal via inhibition of apoptosis. Inhibition of d-galactose (d-gal)-induced hepatocyte apoptosis by hepassocin (HPS). Terminal deoxynucleotidyl transferase-mediated dUTP nick-end labelling (TUNEL) staining was performed on liver sections from d-gal-intoxicated (500 mg/kg) rats with HPS (1 μg/kg) or human serum albumin (HSA; 1 μg/kg) treatment. The TUNEL-positive cells are shown by arrows, and values are the mean±SD of five fields of measurements. The statistical difference between the two groups was demonstrated as *p≤0.05 or **p≤0.01. To explore the mechanism of inhibition of d-gal-induced hepatocyte apoptosis by HPS, we analysed the expression of several molecules related to d-gal-induced apoptotic pathways. 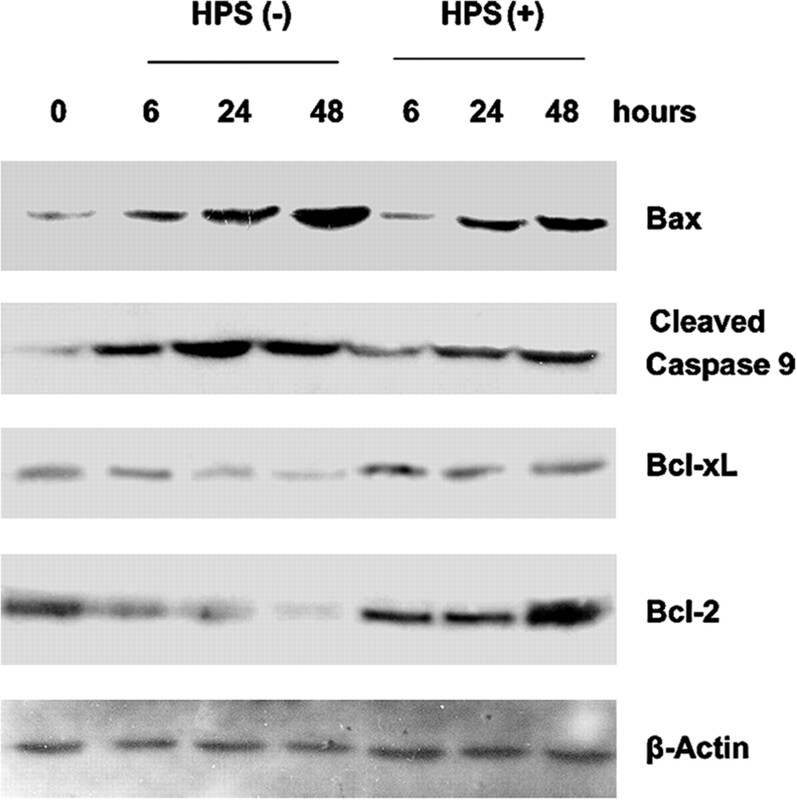 As figure 9 shows, in the control group, the expression level of the proapoptotic factor Bax was increased and the activated form of caspase 9 was induced by d-gal in a time-dependent manner. In the HPS treatment group, the levels of the two factors were also increased after d-gal injection but were much lower than in the control group. Furthermore, d-gal administration resulted in significant downregulation of the antiapoptotic factors Bcl-2 and Bcl-xL. At 48 h after d-gal injection, the expression of Bcl-2 was markedly inhibited. However, HPS treatment eliminated the downregulation of Bcl-2 and Bcl-xL induced by d-gal, and their expression were maintained at high levels up to 48 h. A significant upregulation of Bcl-2 was further detected. These results suggested that HPS inhibited the hepatocyte apoptosis induced by d-gal by affecting the expression of apoptosis-related factors. Hepassocin (HPS) affects the expression of apoptosis-related factors in d-galactose (d-gal)-intoxicated rats. Liver samples from d-gal-intoxicated rats with HPS (1 μg/kg) or human serum albumin (HSA; 1 μg/kg) treatment were harvested at the indicated time points and total lysates were extracted for western blotting analysis with the antibodies indicated. β-Actin was used as an internal control. As shown in figure 8, by 24 h after d-gal administration, hepatocellular necrosis was maximal, suggesting an ongoing liver injury. To investigate whether HPS is effective in ongoing liver injury, rats were injected intraperitoneally with 500 mg/kg d-gal for 24 h and then were administered a single injection of recombinant HPS at a concentration of 1 μg/kg or the same dose of HSA as negative control. As shown in Supplementary figure 4, HPS treatment resulted in reduced elevation of ALT and AST values, which suggested a protective effect of HPS on liver function. Furthermore, we performed TUNEL staining to analyse the apoptosis of hepatocytes. Twenty-four hours after HPS treatment, the rats showed only 20.2% hepatocyte apoptosis whereas the control group showed up to 35% apoptosis (Supplementary figure 5). At 48 h after treatment, the HPS group showed 4.1% apoptosis and the control group still showed 22.2% TUNEL-positive cells. These data indicated that HPS prevents ongoing liver injury induced by d-gal. To investigate the role of endogenous HPS in liver injury, we performed RNAi treatment in vivo. Three siRNA oligos against mouse HPS were used and all of them significantly reduced the HPS mRNA level to ∼40% in a mouse hepatocellular carcinoma cell line Hepa1-6, as measured using real-time PCR (data not shown). However, when injected into the mouse tail vein, each of the three siRNA oligos only reduced the HPS level to 60% (data not shown) due to a relatively low transfection efficiency in vivo. To increase the efficiency of RNAi, we mixed the three siRNA oligos for injection and the level of HPS was reduced significantly (35±5%, p<0.05, figure 10A, B). Forty-eight hours after the last injection, the mice were treated with 500 mg/kg d-gal. After 24 h, we observed that knockdown of endogenous HPS resulted in a significant elevation of ALT and AST levels compared with the negative controls (figure 10C, D). Liver histology revealed more severe pathological changes in mice treated with HPS siRNA oligos (Supplementary figure 6). The apoptosis was measured by TUNEL analysis. As shown in figure 10E, in negative control and saline-treated mice, the apoptosis was increased to ∼40% or 45%, respectively, after d-gal treatment for 24 h, while the mice treated with HPS siRNA showed more apoptosis, reaching ∼72%. At 48 h, the apoptosis in the control groups decreased to ∼20%, while the HPS siRNA-treated mice still showed up to 42% hepatocyte apoptosis. No significant apoptosis was observed in control mice and mice treated with HPS siRNA in the absence of d-gal (data not shown). 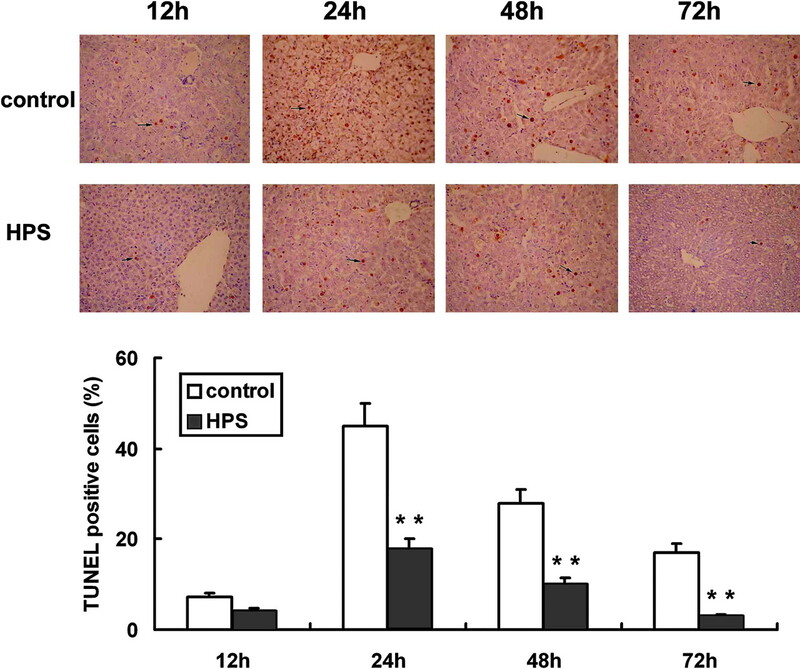 These data confirmed that endogenous HPS is a key physiological regulator of liver injury. RNA interference (RNAi) targeting hepassocin (HPS) enhanced the liver injury induced by d-galactose (d-gal) in mice. (A) BALB/c mice (n=4) were injected with normal saline or control negative small interfering RNA (siRNA) or HPS siRNA oligo mix three times. Forty-eight hours after the last injection, total RNA was extracted for real-time PCR (A) and total protein was prepared for western blotting analysis (B). Results were expressed as the mRNA level relative to mice injected with saline and normalised to glyceraldehyde phosphate dehydrogenase (GAPDH) mRNA. At the time points indicated, the plasma a levels of alanine aminotransferase (ALT) (C) and aspartate aminotransferase (AST) (D) were measured, and terminal deoxynucleotidyl transferase-mediated dUTP nick-end labelling (TUNEL) staining was performed (E). The statistical difference between the two groups was demonstrated as *p≤0.05 or **p≤0.01. N.C., normal control. Human HPS is a liver-specific protein that has mitogenic activity on hepatocytes in vitro and is upregulated during liver regeneration. In this study, we demonstrated that HPS stimulated hepatocyte proliferation in vivo and prevented rat liver injury induced by d-gal and CCl4. Delayed treatment with HPS after administration of d-gal and CCl4 significantly improved the survival of the animals and inhibited hepatocyte apoptosis, and knockdown of endogenous HPS enhanced the liver injury induced by d-gal. These results demonstrated the therapeutic value of HPS in treatment of FHF. It has been reported that recombinant human HPS had hepatic-specific DNA synthesis-stimulating activity in vitro.13 In the present study, we demonstrated that recombinant human HPS stimulated DNA synthesis in primary hepatocytes and the human hepatic cell line L02, but had no stimulating activity on non-liver-derived cells. These results confirm that HPS is a specific mitogenic factor on hepatocytes in vitro. To assess the effect of HPS on growth of hepatocytes in vivo, we administered HPS to rats with PHx or liver injury induced by d-gal or CCl4. Our results indicated that recombinant human HPS exerted an important role in promoting cell proliferation in hepatocytes in vivo. Furthermore, silencing of HPS by RNAi resulted in hepatocyte growth inhibition, suggesting that human HPS may be an endogenous physiological regulator of hepatocyte proliferation. Additionally, we demonstrated that HPS induced phosphorylation of ERK1/2 in a time-dependent manner, and inhibition of the ERK1/2 pathway blocked HPS-induced proliferation, which suggested that the ERK1/2 pathway was involved in the HPS-induced proliferation effect. Although we and other researchers have shown that HPS was upregulated during liver regeneration in mice, no direct data showed the upregulation of HPS in humans. Recently, our investigations using in vivo luciferase assays by injecting the human HPS promoter construct into mice have indicated that the human HPS promoter activity increased ∼3-fold after 70% PHx. IL-6 treatment can also induce the HPS promoter activity. Deletion and mutation analysis suggest that the binding sites of the transcription factors hepatocyte nuclear factor-1α (HNF1α) and STAT3 (signal transducer and activator of transcription 3) on the HPS promoter are essential for the upregulation of HPS induced by PHx and IL-6.18 Previous studies have shown that both HNF1α and IL-6 are involved in human liver regeneration, thus we suggested that HPS expression may be controlled by similar mechanisms and enhanced expression would be found after liver damage in humans. Detection of blood concentrations of HPS in patients with FHF may provide more evidence that HPS is involved in human liver regeneration. Our preliminary study analysing blood samples from patients with hepatocellular carcinoma before and after liver resection revealed that the serum HPS level is increased significantly after hepatectomy (data not shown), suggesting an upregulation of the human HPS protein level in liver regeneration. Since many FHF deaths result from absent or impaired hepatic regenerative activity, an appropriate treatment strategy would consist of medical interventions that either directly promote hepatic regeneration or negate the effects of circulating growth inhibitors. HPS is a hepatic-specific gene which is strongly upregulated during liver regeneration.14 Thus, we assume that treatment with HPS would have a protective effect on chemically induced FHF. In the present study, we found that treatment of rats with HPS after administration of d-gal and CCl4 significantly inhibited the development of FHF in both rat models by preventing the high mortality rate. Consistent with these findings, liver histology in the HPS treatment group showed significantly less hepatic necrosis, although substantial infiltration of liver tissue with inflammatory cells was still observed; this is consistent with moderate elevations of AST and ALT levels in the HPS groups. Previous studies suggested that HGFs play an important role in liver mass restoration and repair after injury by actions on cell proliferation and apoptosis.19–21 It has also been shown that HPS stimulates the proliferation of hepatocytes in vitro.13 In the present study, we provided evidence that HPS stimulates liver regeneration after PHx and in chemically induced liver injury. Other researchers demonstrated that HGF and IL-6 also seem to prime hepatocytes to regenerate, probably by triggering the G0 to G1 phases of liver cell proliferation.22 In addition, IL-6 and HGF have an antiapoptotic effect in hepatocytes.23–26 HPS also showed antiapoptotic effects in the present study. Beginning at 24 h after d-gal injection, a decrease in apoptotic cells in the liver tissues was observed after HPS treatment. Because the mechanism of apoptosis occurred in a stepwise manner, involving various molecules at different times during its progression, it is of interest to determine how HPS affects the molecules in the apoptotic pathway. The present study revealed that HPS treatment inhibited the upregulation of proapoptotic factors such as Bax and cleaved caspase 9 induced by d-gal while increasing the expression level of antiapoptotic factors such as Bcl-2 and Bcl-xL, suggesting a potent antiapoptotic effect of HPS on d-gal-induced hepatocyte apoptosis in vivo. In conclusion, we have documented that HPS improves survival and hepatic regenerative activity and protects against hepatocyte apoptosis in an animal model of toxin-induced liver disease. These data highlight the potential interest in HPS for the treatment of FHF.
. Liver-specific growth factors. Scand J Gastroenterol Suppl 1988;151:31–6.
. Identification of the hepatocyte growth factor receptor as the c-met proto-oncogene product. Science 1991;251:802–4.
. Transforming growth factor alpha may be a physiological regulator of liver regeneration by means of an autocrine mechanism. Proc Natl Acad Sci USA 1989;86:1558–62.
. 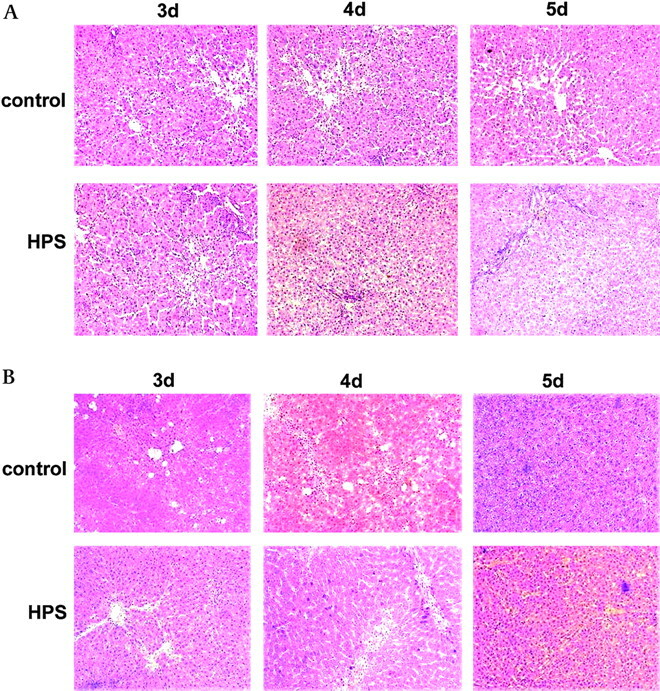 Influence of epidermal growth factor on liver regeneration after partial hepatectomy in rats. Hepatology 1988;8:992–6.
. Heparin-binding growth factor type 1 (acidic fibroblast growth factor): a potential biphasic autocrine and paracrine regulator of hepatocyte regeneration. Proc Natl Acad Sci USA 1989;86:7432–6.
. Increased expressions of vascular endothelial growth factor and its receptors, flt-1 and KDR/flk-1, in regenerating rat liver. Biochem Biophys Res Commun 1996;226:176–9.
. Tumor necrosis factor-induced hepatocyte apoptosis precedes liver failure in experimental murine shock models. Am J Pathol 1995;146:1220–34.
. Lethal effect of the anti-Fas antibody in mice. Nature 1993;364:806–9.
. Significance of Fas antigen-mediated apoptosis in human fulminant hepatic failure. Am J Gastroenterol 2000;95:2047–55.
. Circulating proinflammatory cytokines (IL-1 beta, TNF-alpha, and IL-6) and IL-1 receptor antagonist (IL-1Ra) in fulminant hepatic failure and acute hepatitis. Clin Exp Immunol 1994;98:71–7.
. Molecular cloning and initial characterization of a novel fibrinogen-related gene, HFREP-1. Biochem Biophys Res Commun 1993;193:681–7.
. LFIRE-1/HFREP-1, a liver-specific gene, is frequently downregulated and has growth suppressor activity in hepatocellular carcinoma. Oncogene 2004;23:1939–49.
. Molecular cloning and functional expression analysis of a cDNA for human hepassocin, a liver-specific protein with hepatocyte mitogenic activity. Biochim Biophys Acta 2001;1520:45–53.
. Isolation and characterization of a novel liver-specific gene, hepassocin, upregulated during liver regeneration. Biochim Biophys Acta 2000;1492:31–44.
. Perfusion technique of suckling rat liver, and comparison of cytologic and biochemical properties between hepatocytes isolated from suckling and adult rats. Res Exp Med (Berl) 1986;186:121–31.
. Animal models of liver regeneration. Biomaterials 2004;25:1601–11.
. Apoptotic cell death in the response of D-galactosamine-sensitized mice to lipopolysaccharide as an experimental endotoxic shock model. Infect Immun 1996;64:734–8.
. 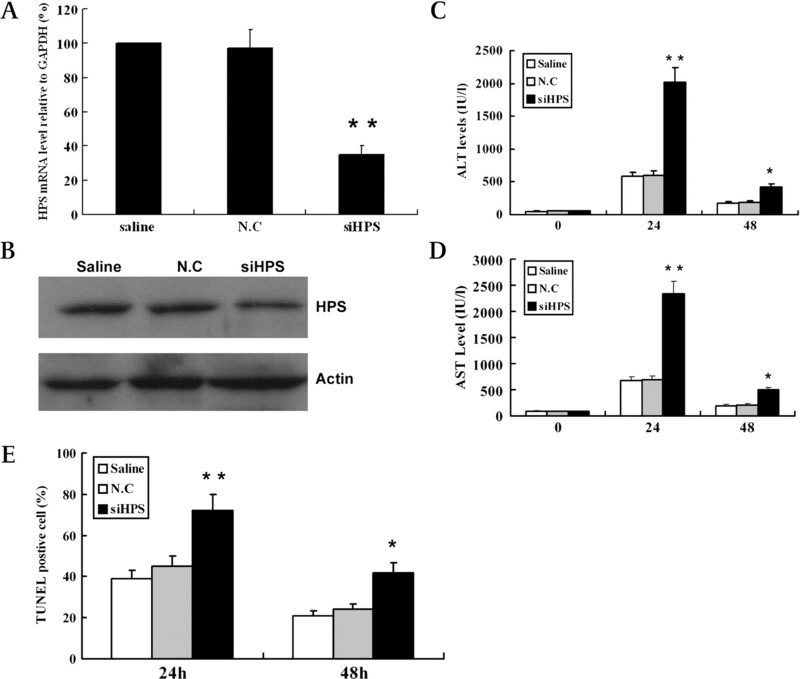 Specific expression and regulation of hepassocin in the liver and down-regulation of the correlation of HNF1alpha with decreased levels of hepassocin in human hepatocellular carcinoma. J Biol Chem 2009;284:13335–47.
. Continuous hepatocyte growth factor supply prevents lipopolysaccharide-induced liver injury in rats. FEBS Lett 1997;411:378–82.
. The role of cytokines in pharmacological modulation of hepatic ischemia/reperfusion injury. Curr Pharm Des 2006;12:2867–73.
. Hepatic regeneration: if it ain't broke, don't fix it. Can J Gastroenterol 2003;17:418–24.
. Liver regeneration. J Hepatol 2000;32:19–31.
. Intracellular survival pathways in the liver. Liver Int 2006;26:1163–74.
. A mechanism of cell survival: sequestration of Fas by the HGF receptor Met. Mol Cell 2002;9:411–21.
. Hepatocyte growth factor prevents endotoxin-induced lethal hepatic failure in mice. Hepatology 1999;30:151–9.
. Intravenous injection of an adenovirus encoding hepatocyte growth factor results in liver growth and has a protective effect against apoptosis. Mol Med 2000;6:96–103. Funding This work was partially supported by the Special Funds for Major State Basic Research of China (2006CB910802. 2009ZX09103-615), National HighTec Research Developing Program (2006AA02A310), Chinese National Natural Science Fund for the Popularisation of Science (30321063) and Chinese National Science Foundation Key Program Projects (30630035).